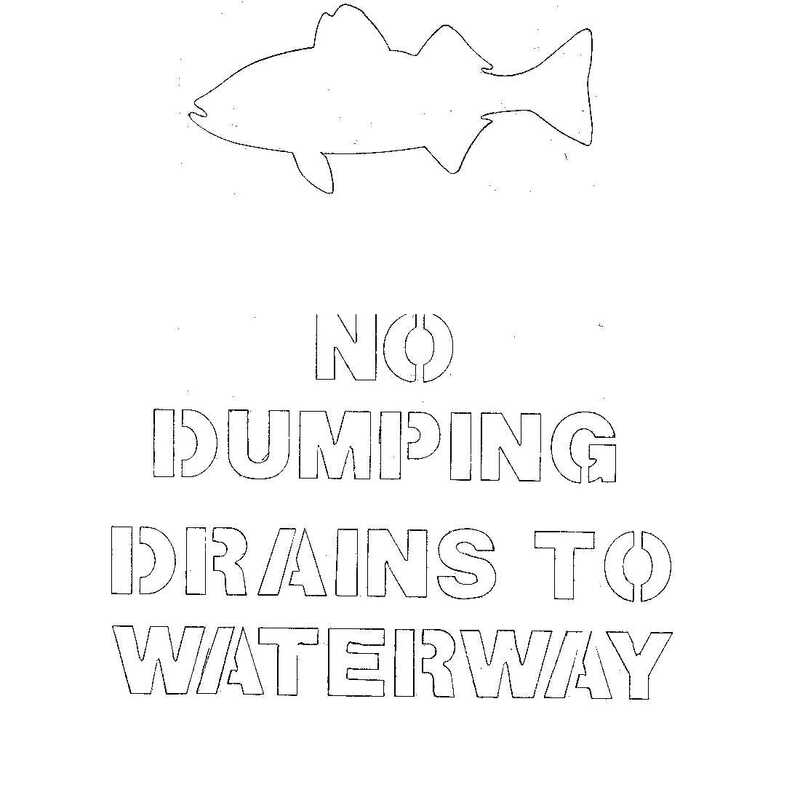 Storm Drain Stenciling is an activity that draws attention to one of the many types of non-point source pollution: stormwater runoff. In this activity, individuals paint a stencil onto a storm drain, reminding people that litter and pollutants that enter the storm drain can end up in our waterways. Storm drains channel rainwater from our city and suburban streets to the stormwater pipes underground. There are different designs of storm drains. Often they are openings in the curb, or sometimes they can be in the form of a grating over the side of a roadway. As gutters are designed to move rainwater off your house's roof and away from the house, storm drains are designed to direct water into stormwater pipes, to move it away from roads and buildings and into the nearest waterway. How are storm drains and pollution related? Many people are unaware that storm drains carry stormwater to the nearest waterway, often without any kind of filtration or treatment. The nearest waterway may be a small creek or ditch, but that creek eventually will connect to a larger stream or river, which eventually will drain into a pond, lake, bay or the ocean. Many of us obtain our drinking water from these sources, so eventually, we are drinking the same water that at one time fell as rain and drained off of our neighborhood streets through storm drains. The debris and chemicals that are carried by the water flowing through storm drains can pollute our water supply and also threaten marine life living within the water bodies that receive the water. It our responsibility to let only rain go down the storm drains. The purpose of painting a fish or other animal on the storm drain is to remind students, residents and visitors to a community, that what ever goes into that storm drain does not just disappear, but will continue into the environment affecting all life, human and otherwise, in that area. Visitors to the area that notice the stenciled message on the storm drain will learn about the importance of stormwater runoff and how our community cares for the environment. Some may even take this knowledge back to their community and do a stenciling program in their town. Clean Ocean Action's Storm Drain Stenciling Kit contains step-by-step instructions, two re-usable vinyl stencils, and 50 educational door hangers (to inform residents about the stenciling project). To order one of our Storm Drain Stenciling Kits, click here. 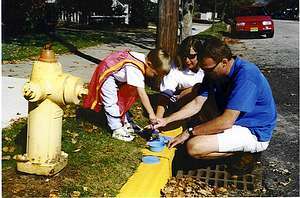 Step-by-step instructions for completing a storm drain stenciling project are also available here. Clean Ocean Action has designed a free "You are the Solution to Pointless Pollution" Education Kit that includes interactive programs and hands-on activities on the problem of non-point source pollution for all grade levels. This packet includes lessons, activities, and factsheets, in the subjects of geography, mathematics, creative writing, social studies, and much more. 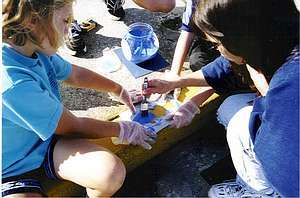 The packet also includes activities to become familiar with storm drain systems and the connection to local waterways. To order an Education Kit, click here. Clean Ocean Action also has a VHS tape called "Painting The Town Blue." This 22-minute informative video demonstrates how one class learned about the problems of non-point source pollution and what they can do to prevent this problem, including stenciling storm drains. "Painting The Town Blue" shows some of the activities of the Storm Drain Stenciling Packet as well as how a class stenciled fish on the community's storm drains. "Painting The Town Blue" is available for rent ($5) or purchase ($15) at Clean Ocean Action's offices or may be ordered by clicking here.